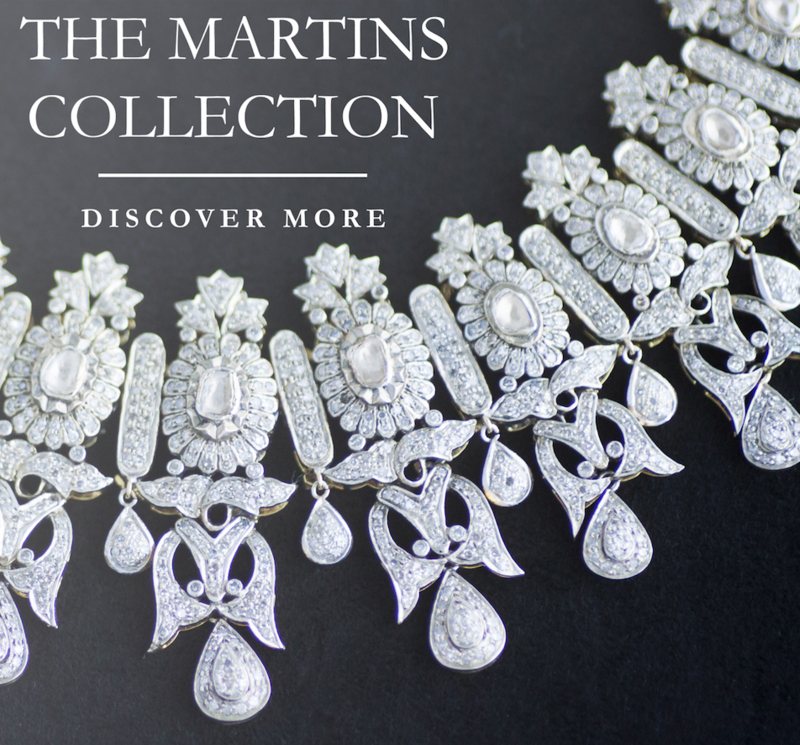 We are excited to introduce The Martins Collection, a diverse accumulation of magnificent and unique jewels from the most impressive eras of design. From the private personal collection of a prolific Portuguese jewellery collector, these pieces encompass a variety of beautiful designs and styles from around the globe. What began as a childhood love of pirates and their gleaming treasure chests soon evolved into a love-affair with luxurious and spectacular jewellery, motivated by quality, not quantity. With many of the pieces descending from noble and affluent owners, these jewels are encrusted with tens of carats worth of diamonds, sapphires, emeralds, rubies and pearls. This stunning necklace encrusted with 17 large diamonds of 3.40ct and 2505 small diamonds of 50.10ct weights 111.9 grams and comes with a pair of earrings each encrusted with a large diamond and 256 small diamonds. This beautiful suite is more than a century old as it has been handed down through generations of an affluent family. A necklace encrusted with 170 baguette shaped diamonds of 1.7 carat and 433 brilliant-cut diamonds. Weighing 83.9 grams, this piece originally belonged to a noble family and boasts 170 baguette-cut diamonds. Likened to Cleopatra, this striking piece illustrates how the collection does not conform to one style but embraces designs from all eras and aesthetics. This triple strand pearl necklace is encrusted with 26 rubies, 5 emeralds and 98 brilliant-cut diamonds was originally a wedding gift from father to daughter. This classic necklace certainly has the wow-factor and would make a beautiful and sentimental gift for a modern-day bride. For a limited time only, a carefully selected edit of the The Martins Collection will be available for purchase exclusively through Rare Pink. Experience the magic of these spectacularly impressive pieces for yourself and take a look.